We were delighted when we started to carry new Alden Parkes furniture and home accessories, and our customers have been delighted with their purchases too! Alden Parkes is very clever at updating classic furniture designs for today’s homes. The craftsmanship is also very high quality including hand-carved details, using top notch materials including fine woods and solid brass hardware. 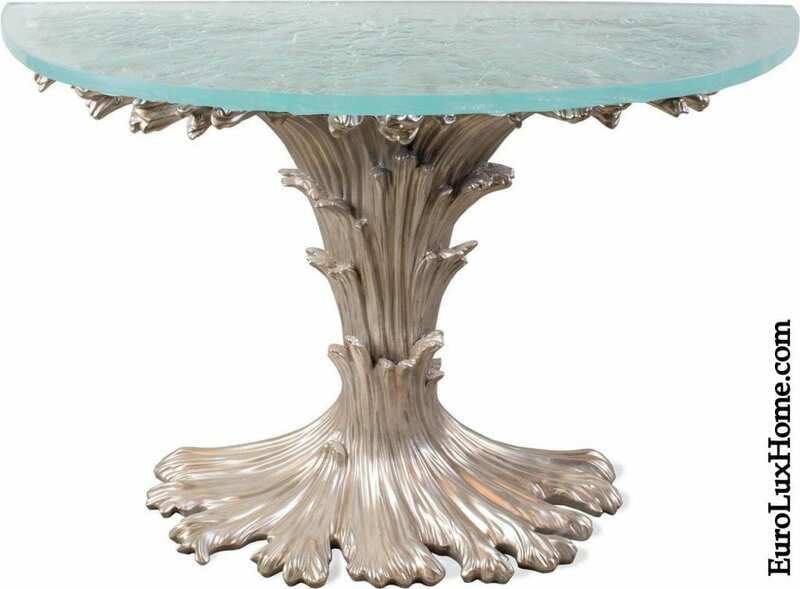 For example, this gorgeous new hand-painted Alden Parkes Yin cocktail table or coffee table. It’s a perfect choice if you love Chinoiserie or have an Asian decor theme. The square cocktail table is crafted in wood with a traditional Asian style black finish. 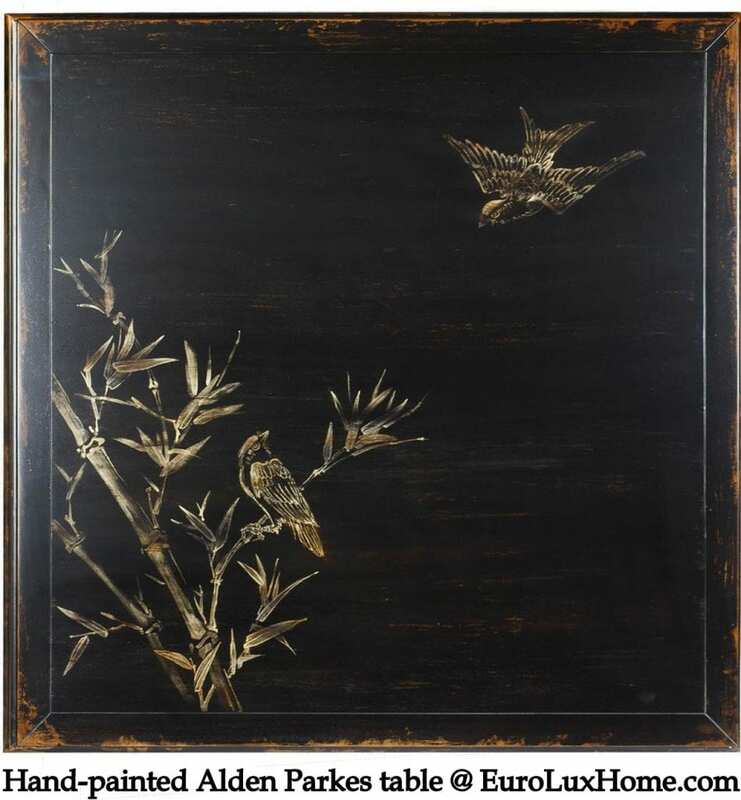 A design of bamboo and birds is hand-painted in antique gold on the top of the table. You can see how luxurious it looks and the distressing creates a sense of age. Equally handsome but in a very different historical style, we love this this Alden Parkes Tudor chest. Part of the fun of this piece is the secret drawer in the base panel! The chest is flanked by hand-turned and carved acacia barley twist corner posts, and it is inlaid with oak burl with a distressed finish. Some Alden Parkes pieces are real showstoppers, like this Alden Parkes console. The demilune or semi-circular glass top is supported by a sculptural base that reminds us of ocean waves. The Champagne leaf finish is super-glamorous. This console is a wonderful focal point for your foyer or perhaps you’ll enjoy it in a bedroom or even a chic powder room! Also packed with glamour, this Alden Parkes dining chair or arm chair is just one of a wide selection of arm chairs, dining chairs, side chairs and occasional chairs. 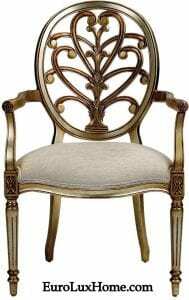 Inspired by antique French furniture, this chair is beautifully decorative with its classic honeysuckle design. The mahogany chair is hand-carved and hand-painted, and upholstered in timeless Euro Linen fabric. The chair is available in two color options: Burnished Silver with gold accents or a soft semi-gloss black with light green and gold hand painted accents. Either way, it’s a treat for your dining room or anywhere that you need a gorgeous arm chair. In a completely different style, this new Alden Parkes cabinet is a stunning update on Mid-Century Modern furniture. The storage cabinet is designed with clever interlocking sliding doors and you can use it as a cabinet, sideboard, console, or dresser. 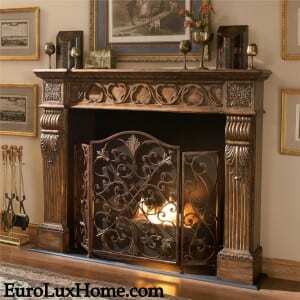 It is finished with a luscious hand-rubbed walnut stain which gives a warm glow. Solid brass accents provide the perfect final touch. As you can see, you can find Alden Parkes furniture and home accessories on our website to suit all tastes and decor styles! I hope you’ll have a browse around and get in touch if you are looking for a specific kind of piece! We love to help you, whether by phone, email or online chat at our website. There are pieces for your living room, dining room, bedroom or hallway, and a very unusual and decorative collection of Alden Parkes wall mirrors. 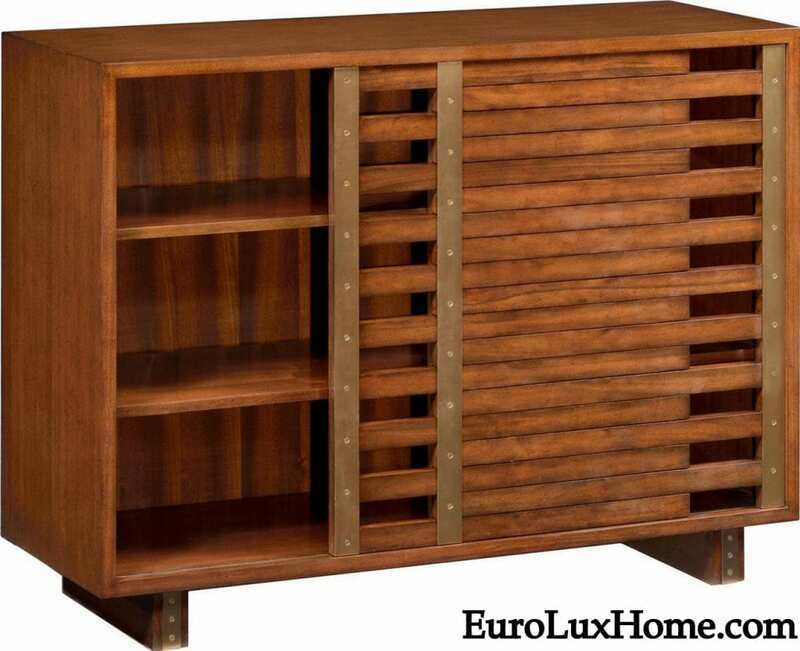 This entry was posted in News and tagged Alden Parkes, antique inspired furniture, bedroom furniture, expert craftsmanship, High quality new furniture, high quality reproduction furniture, mid-century modern, Mid-Century Modern Sideboard, reproduction dining chair, reproduction French furniture on August 8, 2018 by admin. We recently started carrying French Heritage furniture and decor, so if you don’t find a piece you want in our antique French furniture, you can search the French Heritage furniture to see if there is a newly crafted antique-inspired item to your taste! As the name suggests, the French Heritage collection is perfect for anyone who likes traditional French style decor. Although the furniture draws on classic French taste, the pieces are often given a little contemporary twist to make them perfect for today’s homes. The French inspiration is authentic. The company’s co-founder is French and his eye for style is inspired by his childhood memories of browsing around Parisian antique markets. He married an American fashion model, so the dynamic duo decided to combine heritage French furniture design with a fashion-forward creative edge. The pieces are made with the same European furniture-making techniques and hand-crafted elements that have been traditional skills for centuries. Just one of these lovely pieces will evoke the French lifestyle and set the tone for your French decor. 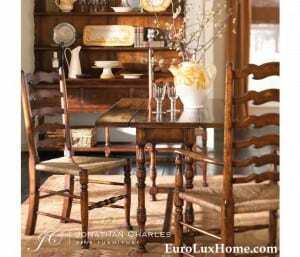 For example, see this fine new French Heritage Maison dining chair In the always popular French Country Farmhouse or French Provincial style. The antique cherry finish on the dining chair’s wood frame combined with the lovely striped upholstered seat and cane back make this charming chair a sure pick to become a family heirloom. 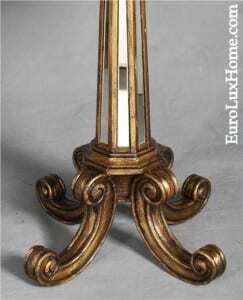 If you are a fan of traditional French Country style then you know that it is always elegant and graceful. Even though it is quite decorative, it is easy and comfortable to live with. 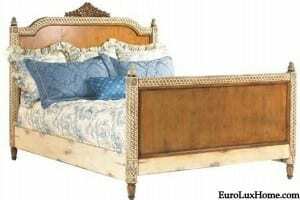 This pretty new French Country Louis XVI bed is a great example. The French Heritage Maison Lilles bed features hand-carved accents and I think we can all agree that it is fit for a princess! If you have a French Farmhouse style kitchen, then the French Heritage kitchen islands are sure to capture your attention. Some kitchen islands have built-in wine racks — of course! The one pictured features a painted finish that contrasts nicely with the natural wood, as well as a marble panel and a cutting board. 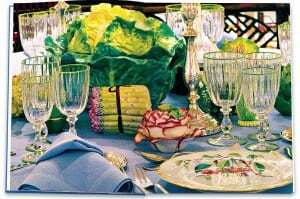 If your French taste veers more toward the glamorous than the rustic, then there are plenty of sophisticated French Heritage choices for you. 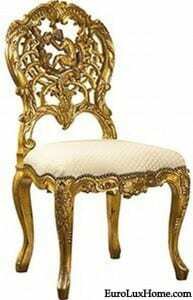 For example, this golden side chair or dining chair looks like it should live in a chic Parisian salon, or perhaps even the Palace of Versailles! The gold finish of the Concerto Monkey Chair enhances the central design of a monkey playing the tambourine. The witty and whimsical design combines with classic cabriole legs and beautiful craftsmanship. We hope that you will browse our French Heritage furniture and decor collection and find something to enhance your own French-inspired decor! This entry was posted in News and tagged antique inspired furniture, bedroom furniture, Farmhouse Style, French Country, French Heritage, High quality new furniture, high quality reproduction furniture, kitchen island, reproduction French furniture on July 19, 2018 by admin. 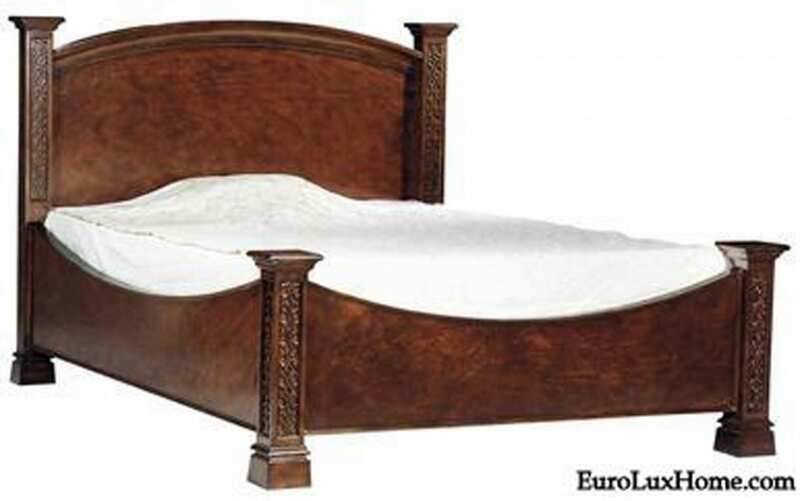 Our Scarborough House bedroom furniture has been really popular lately, Sales have taken off and our customers love their Scarborough House beds – especially the king size beds. Well, when you have such magnificent antique-inspired bed designs and construction, you feel like you’re sleeping in a king’s bed anyway… so you might as well go for the large and comfy king size! This is great example of one of our popular Scarborough House beds. 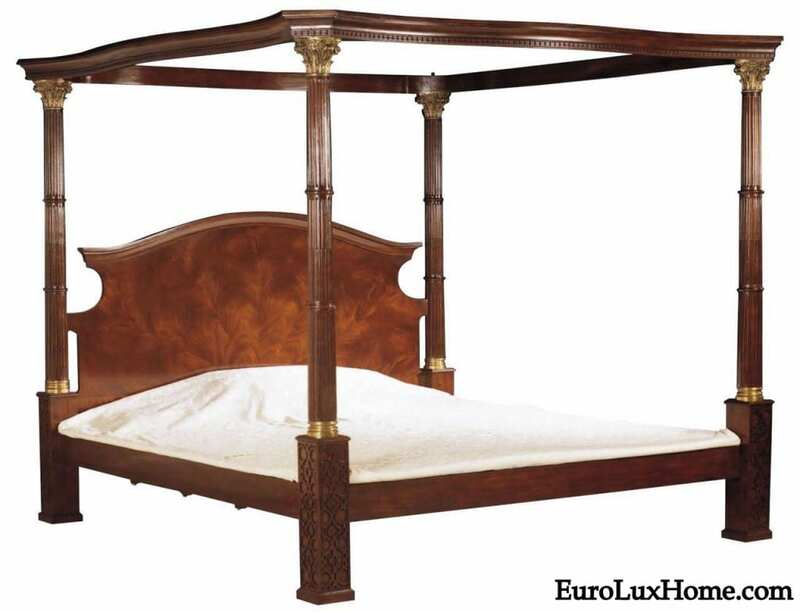 The canopy bed is crafted in crotch mahogany with regal brass accents. Scarborough House Fine Furniture creates antique-inspired pieces that are hand-crafted using age-old techniques. The company even makes its own brass hardware to ensure high quality and perfect styling. Scarborough House was founded by an Englishman who was a fine furniture designer and maker. The attention to detail is just as amazing as you’d expect from such a heritage! Scarborough House is well known for its wood veneers that make each item of furniture a center piece in a room. 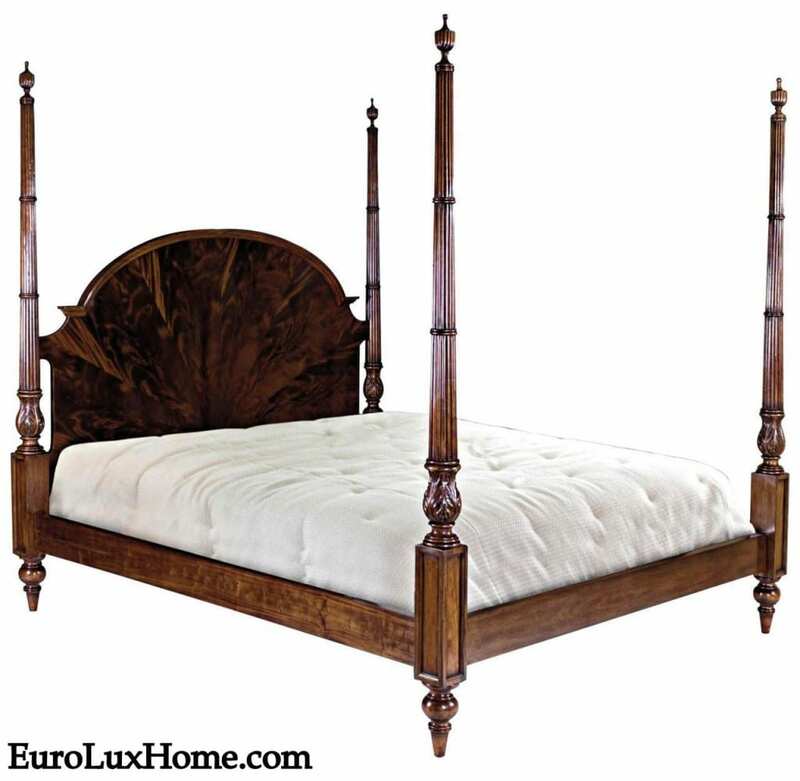 The fine crotch mahogany on this king size four poster bed shows the level of craftsmanship. I bet that this bed will become a family heirloom. This is the other Scarborough House king size bed that our customers are loving right now. You can see why. The silhouette is so chic that it will work in any style of bedroom decor, and the handsome crotch mahogany adds a sense of substance and luxury. 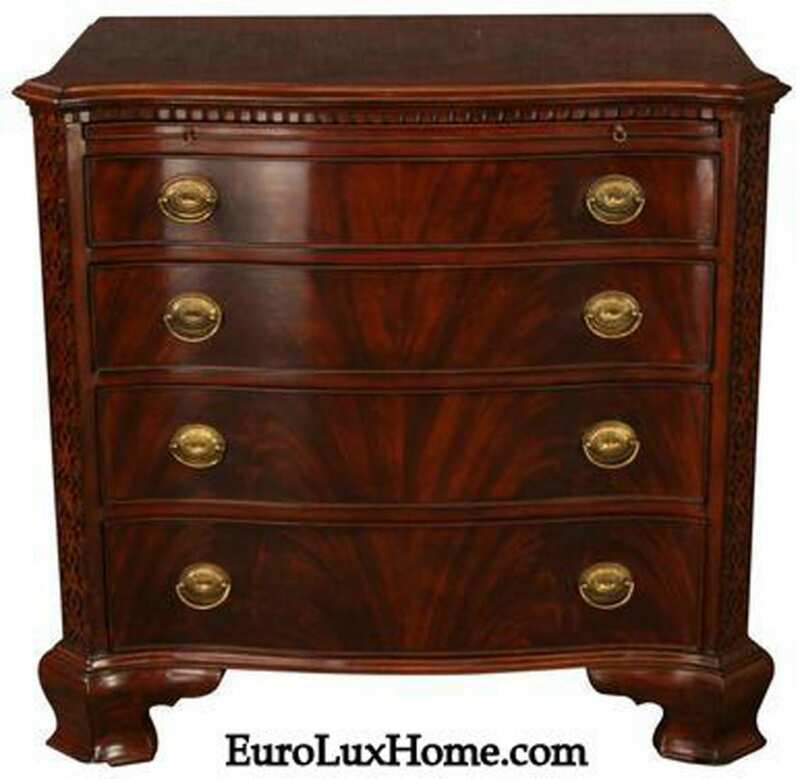 We have a large selection of Scarborough House chests of drawers, but this beauty is winning a lot of hearts lately! 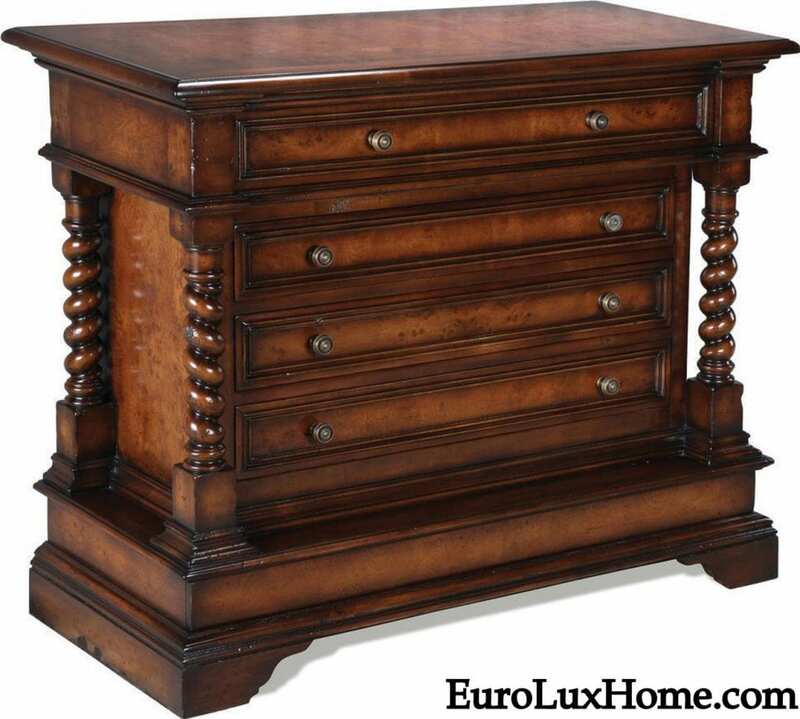 Crafted in crotch mahogany with brass handles, the chest of drawers is a lovely match for the king beds. The traditional techniques used by the high-quality furniture makers means that the drawers are constructed with good old-fashioned dovetail joinery. I am curious about how each customer will dress the top of the chest of drawers. A small mirror or vase of flowers on top would be charming. Some small decorative boxes or silver-framed photos would look good too. As a finishing touch, this Scarborough House drum table is also selling well — for bedrooms, living rooms, entry ways, and really anywhere that you want an exquisite accent table. 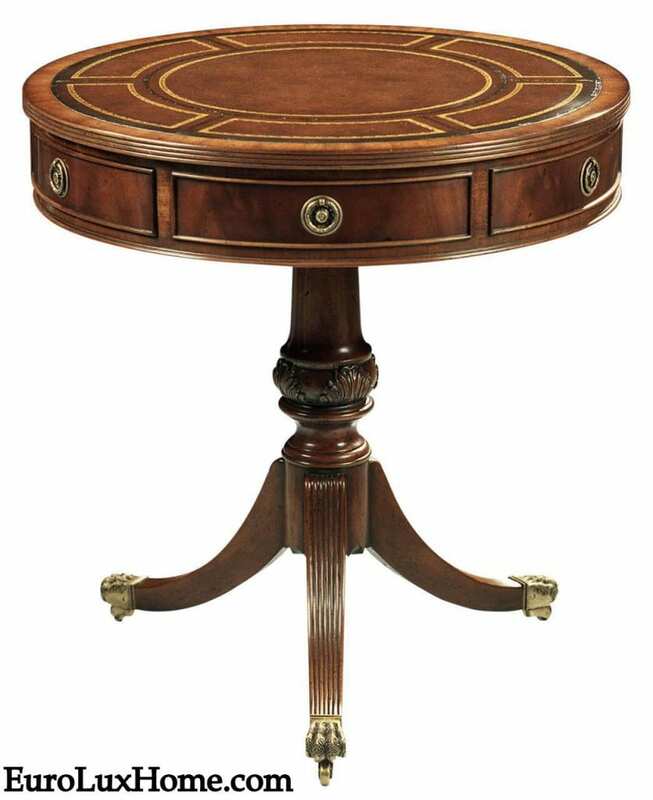 We have a wide choice of Scarborough House tables to browse, all of them as attractive as this delightful 26-inch-wide round drum table crafted in crotch mahogany with a leather top and opulent brass accents. You can browse all our Scarborough House furniture at this link, including chairs, cabinets, desks and sideboards. We have beautiful pieces of antique-inspired furniture for every room in the house! But as it is fall and a great time to prepare a cozy and sumptuous bedroom to see us through the winter months ahead, I am pleased that our Scarborough House beds are so popular with our customers. I think that sweet dreams are guaranteed with such elegant bedroom furniture… What do you think? Which bed is your favorite? This entry was posted in Home Design Ideas and tagged accent table, antique inspired furniture, bedroom furniture, canopy bed, four poster bed, high quality reproduction furniture, reproduction French furniture, Scarborough House on September 27, 2016 by admin. Eric S. purchased this beautiful French Country sideboard in black finish, and when we saw his address in the Washington D.C. area, we knew we’d be delivering this one! He only lives about 45 minutes away from my grandmother’s house. The antique-inspired French Country sideboard (item BG-65 on our website) is beautifully crafted using traditional joinery techniques. 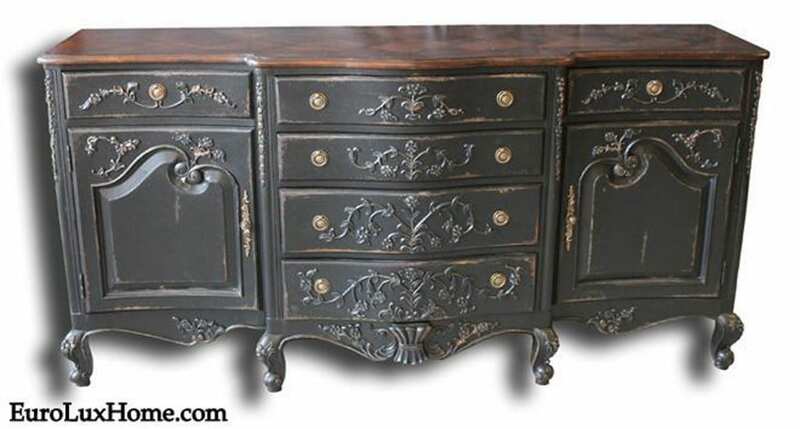 The distressed blackwash finish accents the intricate carving on the raised panels and gives the appearance of age. Detailed hardware creates an authentic French Country look too. Eric recently moved to the Washington D.C. area and has been busy decorating his lovely home. He proudly gave us a tour of the whole house and said he didn’t mind my snapping photos along the way! We delivered the new French Country sideboard into the central hall of his home. The sideboard sits right by the front door and under a gorgeous crystal chandelier. The pretty grey paint creates an elegant impression as you walk in, nicely accented by the design of the rug. 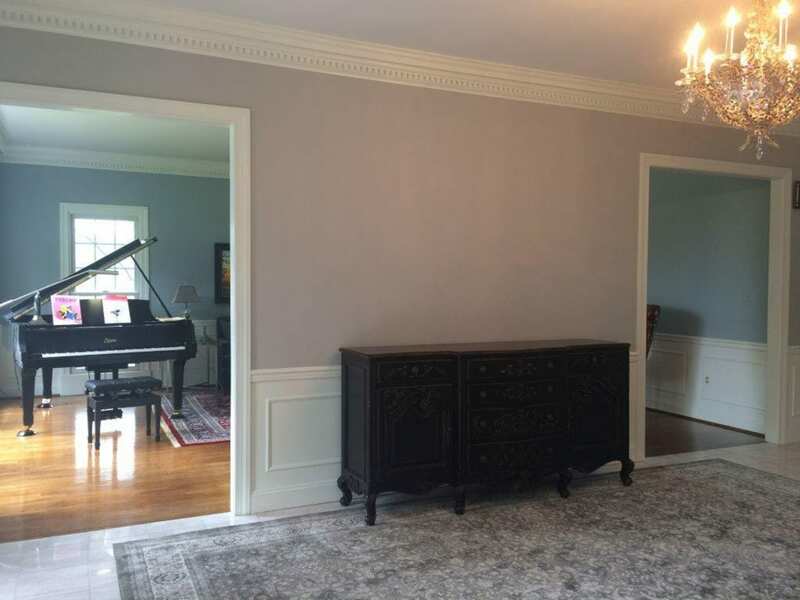 I couldn’t resist taking a shot showing his grand piano in the muted blue music parlor just off the hallway. The piano finish ties so nicely with the sideboard. 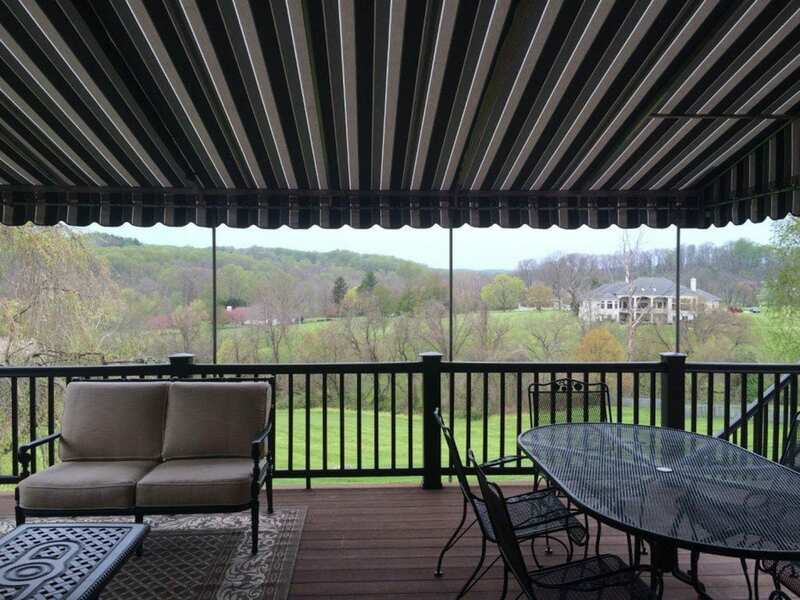 The fantastic view across the back porch is what Eric sees from his home office – I don’t know how he gets anything done with that incredibly relaxing view! This same view is seen through the floor to ceiling windows at the rear of the kitchen, although my photo is backlit and a little grainy. 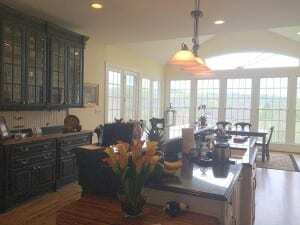 However, my shot of his gorgeous painted white kitchen cabinets with a black finished island and bar stools and black countertops shows how deftly Eric and his wife have used black as a color motif throughout their home. They juxtapose bold, dynamic black with softer grays, blues and greens and crisp, clean white trim. I couldn’t resist taking the photo in the dining room as the chandelier had amazing multi-colored crystals in all the colors of the room. I even noticed that the fresh floral arrangement matched the painting above the fireplace! Every detail is just so nicely considered. I’m sure there will be many happy dinners and gatherings in Eric’s new home in years to come. It is such a welcoming and beautiful space. 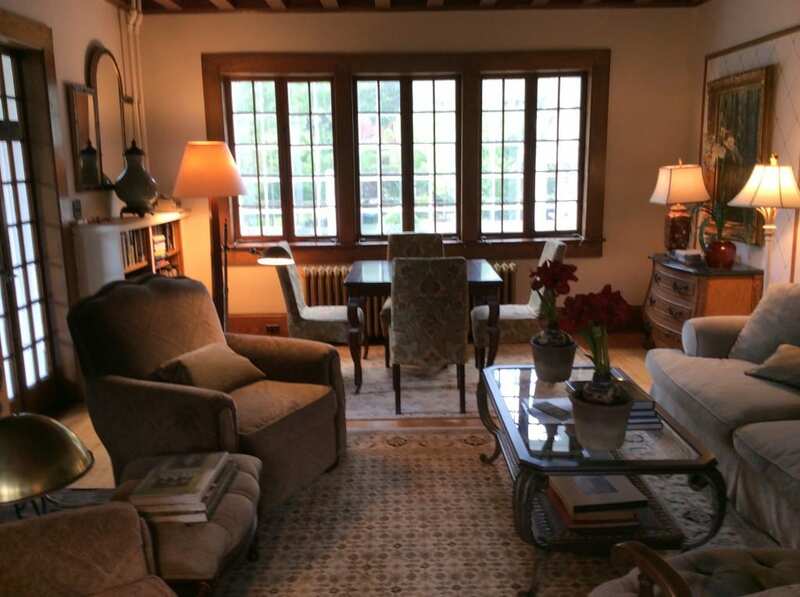 Thanks Eric, for giving a glimpse into your traditional-style home with such elegant use of color! 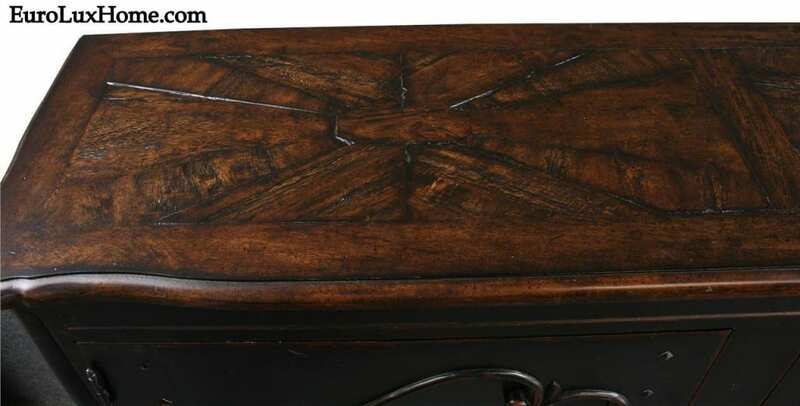 This entry was posted in Client Spotlight and tagged antique inspired furniture, French Country, French Country cabinet, high quality reproduction furniture, reproduction French furniture on July 7, 2016 by admin. I loved seeing the photos our customer Marie-Regina S. in Mountainhome, PA sent of the antique French style game table she bought from us. We got a great glimpse into her beautifully decorated living room! This is the new Woodbridge game table that Marie-Regina chose from our range of vintage and antique-inspired game tables. The high-quality card table follows early 18th century French styling and it is crafted in solid wood with a cherry veneer. The Woodbridge Furniture Company people are very clever with their distressing skills. The hand-rubbed finish gives an aged look that would fool a lot of people into thinking it was an original antique. Here’s the antique-inspired game table in Marie-Regina’s home. This room is so inviting… it looks like a cozy place to spend a few hours playing cards! I can also imagine relaxing here with a good book or chatting with company. Notice how well Marie-Regina defines the conversation area with a large rug, while a separate rug defines the game table area. I can see why… and it pairs perfectly with those handsome wood windows. Personally, I love the upholstery on the chairs. There is so much to enjoy in this room, from the framed lattice design on the far wall to the French style sideboard and the elegant lighting. Marie-Regina has immaculate taste and I’m glad she invited us into her home so we could admire it. And now for a game of cards? If you enjoy cards, chess, and other family games (even shuffleboard!) take a look at our selection of vintage and antique-inspired game tables. We try to select tables that are gorgeous pieces of furniture in themselves, as well as being fun for entertainment after a dinner party or during a family holiday. We hope you agree with us! 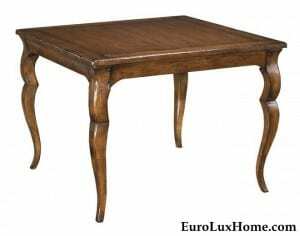 This entry was posted in Client Spotlight and tagged accent table, antique inspired furniture, Game room, game table, high quality reproduction furniture, reproduction French furniture, wood furniture, Woodbridge Furniture Company on May 17, 2015 by admin. Of all the beautiful Ambella Home console tables and accents tables that we stock, the Voronado accent table is one of the most dramatic. So it’s great to have a chance to show it off in this customer spotlight! 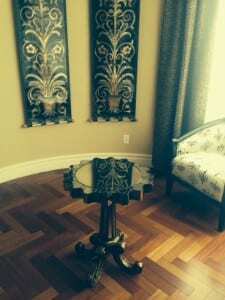 Nellie V. in San Diego, CA bought the Voronado fluted accent table from us. This is the table in the catalog shot. Glamorous, huh? It combines style with substance though. As with all Ambella Home Collection furniture, it is meticulously crafted. The solid mindi wood table features mirrored accents all around to reflect the light. Here’s a close-up of the table top because it’s really hard to photograph mirrored furniture when the piece is in a room. It just reflects all the light and colors surrounding it! But this bird’s eye view shows the great shape of the sunburst design. You can tell how shiny and clear the high-quality mirrored table top is because it reflects the leather wall panels in every intricate detail. Those handsome wall panels have a little dark gold in them, which I’m sure ties in nicely with the gold leaf table finish. The chairs boast a lovely satin silver upholstery. 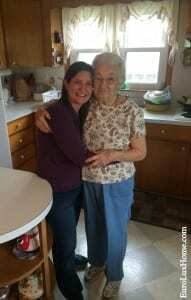 “I just got them, that is why I was looking for the table with mirror,” Nellie told me. “It actually looks much better live than on the pictures.” Well, the pictures make it all look fabulous enough so the in-person effect must be stunning! When I first looked at the photos Nellie sent, I was wowed by what a gorgeous floor she has. I’ve never seen wooden floors with a herringbone pattern before. I wondered if she lives in an old house… so I asked her. Nellie said that the house is a mere 15 years old and she bought it new. The herringbone wood floors were installed 5 years during a remodeling. “We were going for the old European look throughout,” said Nellie. 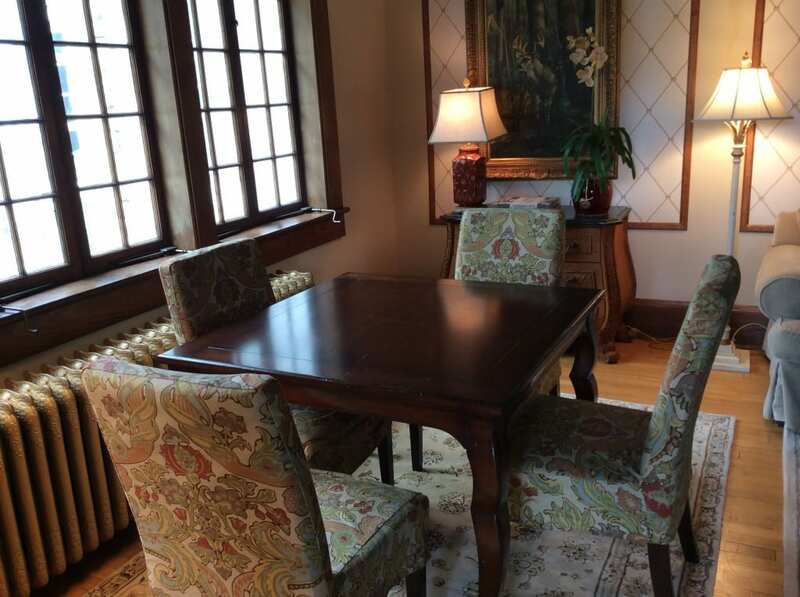 Nellie also mentioned that the room is round, so that informed her choice to pick a round accent table. 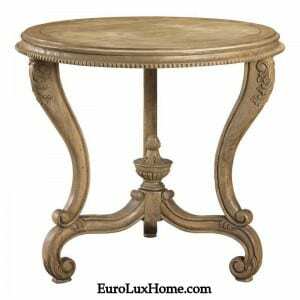 The Ambella Home Voronado accent table is a piece that could fit with a variety of home decor styles, but many people would consider it a great example of Hollywood Regency style. Hollywood Regency style harkens back to the most luxurious golden era of Hollywood around the 1930s and it combined a bunch of different influences. Those influences include the most glamorous elements of English and French Regency furniture as well as the chic allure of Art Deco design. Opulent gilded finishes are typical of the look, as are reflective surfaces from lacquered finishes to glittering mirrored furniture like this Ambella Home table. I’ll write more about the trend and especially the mirrored furniture trend in another blog post later this month. Till then, thank you Nellie for giving us a glimpse inside your home so we can enjoy your exquisite mirrored accent table! 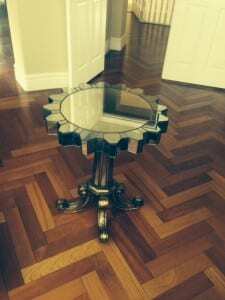 This entry was posted in Client Spotlight and tagged accent table, Ambella Home, gilded furniture, high quality reproduction furniture, Hollywood Regency, mirrored furniture, reproduction French furniture on April 9, 2015 by admin. We took a glimpse inside some incredible traditional homes on the Letters from Eurolux blog this month. Some of those were in our series of Client Spotlights showing the home decor of our customers, with their EuroLuxHome.com purchase in place. Others were in our Bookshelf series about new books on home decorating, antiques, entertaining, gardens, and vintage living! Let’s look back at some of our favorite blog posts in September. Ever since the new Johnny Cash Boyhood Home museum in Dyess, Arkansas, bought an antique table from us, we’ve looked forward to the opening of the restored house. It happened last month and Rosanne Cash said it was “completely restored to a most meticulous and historic detail.” My blog post on the Johnny Cash Boyhood Home and his Royal Scottish Heritage shows photos of the house and table. So who is this guy in the portrait? 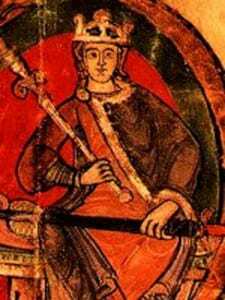 It’s the 12th century King Malcolm IV of Scotland. And what does he have to do with Johnny Cash? Read the blog post and find out! It’s hip to be square! That was my conclusion after writing about Checkerboard Painted Wood Floors. The look works for lots of different room moods and color schemes, as you’ll see in the photos. 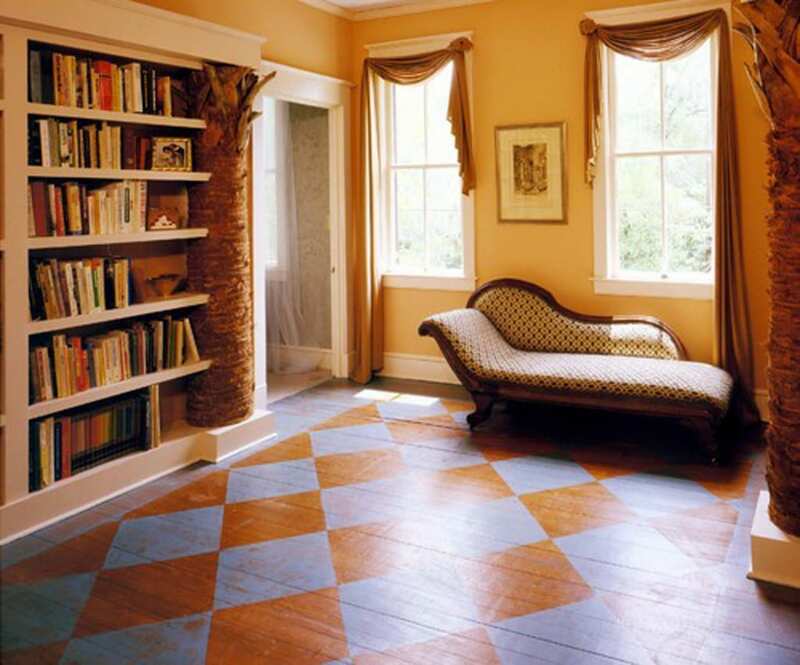 Painted floors were also popular in traditional homes in America as far back as the late 1700s. You can use the tutorial in that post if you are feeling arty and you want to paint a checkerboard floor yourself. Speaking of arty, our customer Richard bought this classic French Country cabinet especially to go under a fabulous abstract painting in his dining room. The new cabinet with a black finish and a marquetry wood top is nicely distressed to give the appearance of age. You can see for yourself that the antique-inspired new French Country cabinet looks wonderful in Richard’s dining room. 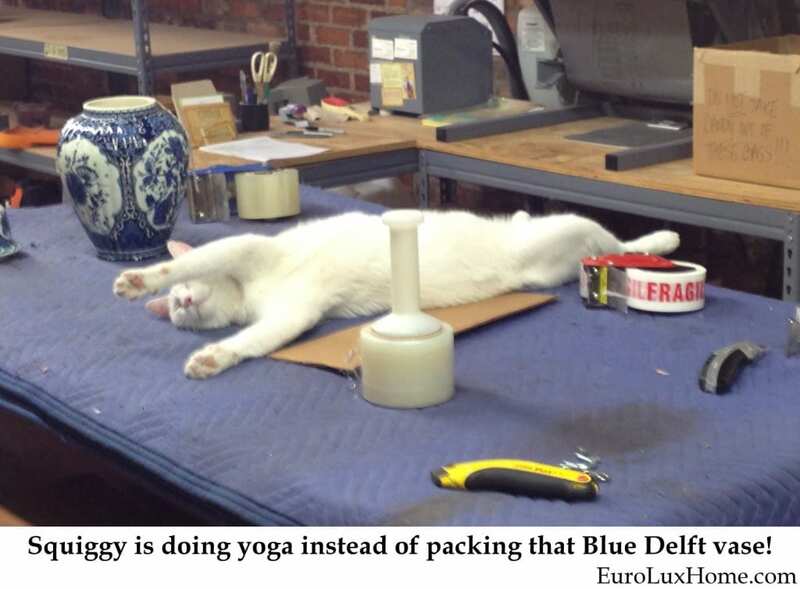 Finally, we never posted this photo of Squiggy doing yoga on the blog, but we did share it on our EuroLux Home Facebook page as one of our regular Furry Friday posts. I just can’t resist sharing it with you here too. Do you think that Squiggy is doing Upward Facing Cat pose? I hope you enjoyed our short overview of our favorite ‘traditional homes’ moments this month. PLUS a kitty as a bonus! This entry was posted in Antique Furniture, News and tagged Antique Furniture, antique inspired furniture, decorating with antiques, high quality reproduction furniture, home decor, home decorating, interior decor, reproduction French furniture, traditional home on September 30, 2014 by admin. 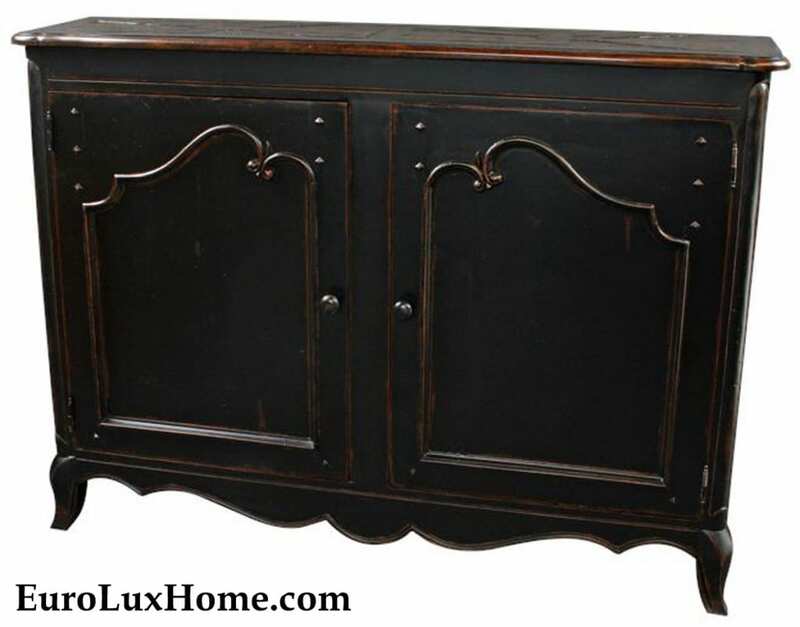 French Country furniture with a black wash finish is a popular choice for kitchens and dining rooms. We have a beautiful range of newly crafted but antique-inspired French Country furniture, and when the piece features a black wash finish it looks really authentic. The black finish gives the appearance of tradition and age, but it still allows the wood grain to shine through. Our client Richard P. in Daniel Island, SC, seems to agree! 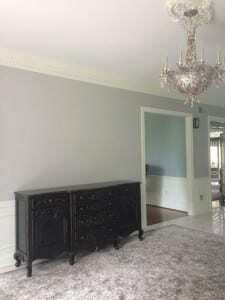 He bought this new French Country cabinet with a black finish and a marquetry wood top for his dining room. The sideboard, server, or cabinet boasts raised panel doors and a scalloped edge which looks very decorative in a kitchen, dining room or hallway. It stands on French Country style feet and it is charming details like this that really give the winning edge to a nice piece of furniture. The distressed blackwash finish looks wonderful too, making the cabinet appear like a family heirloom… or at least an old friend of the family that has been enjoyed for years! 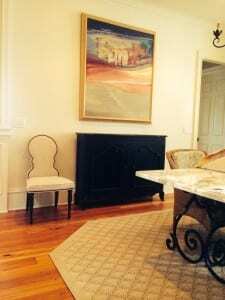 Richard thought that the classic French Country cabinet would look great in his dining room under a gorgeous abstract painting. The black finish on the cabinet works great with the wrought iron light fixture. It pairs beautifully with the wrought iron legs of the dining table too. Richard had the dining table custom-made after he was inspired by marble-top restaurant tables he had seen in France. Joie de vivre! As you can see, the black wash finish turns the cabinet into a high-impact accent and it is utterly timeless… it’s like the perfect little black dress! The use of black in this dining room doesn’t seem heavy, because the black is lifted by the pale neutral walls and upholstery to a very elegant effect. Similarly, although that lovely marble-top table looks substantial and heavy, the pale marble keeps it fresh and graceful. I like the black trim (or is it dark gray?) surrounding the side chair next to the cabinet too. Little touches like that pull a room together. 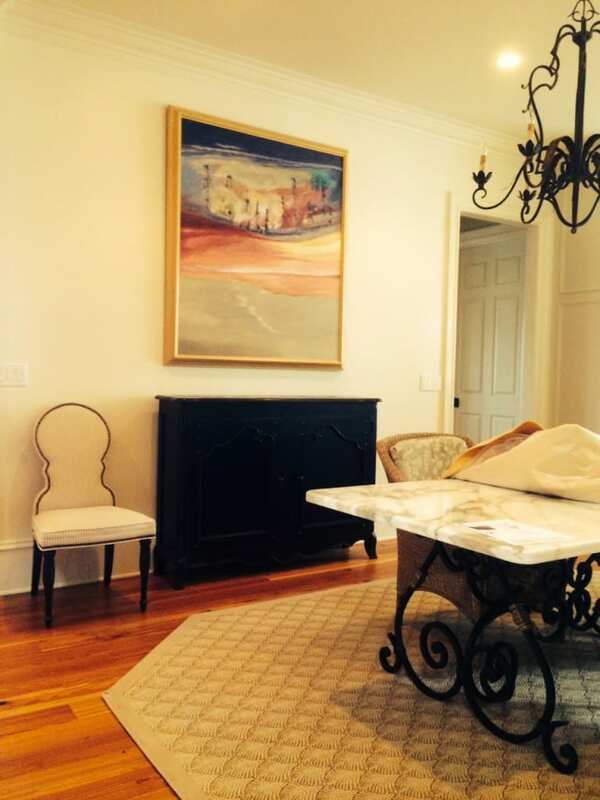 It all makes a refined backdrop to showcase the stunning color of the painting. If you like this look, then also see my recent post about the French Country counter stools in our client Stephanie’s kitchen, also boasting a black wash finish to beautiful effect. 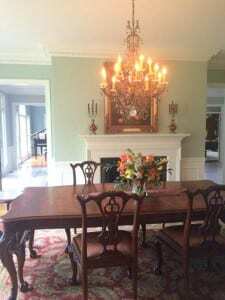 This entry was posted in Client Spotlight and tagged dining room, French Country, French Country cabinet, French dining, heirloom quality furniture, high quality reproduction furniture, reproduction French furniture, reproduction furniture on September 11, 2014 by admin. We started the month proudly announcing that we have changed our name to EuroLux Home. This is because we are doing so much business these days with antique-inspired new furniture, so the broader name shows that we offer much more than just antiques now. 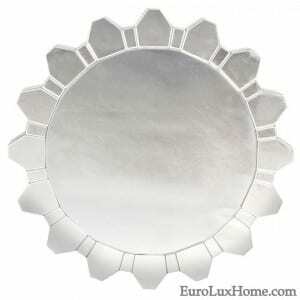 At EuroLuxHome.com you’ll find a wide range of new, antique-inspired furniture and home accents. For example, collections by Jonathan Charles, exquisitely crafted using the same techniques as original antique English and French furniture. You can see exactly what we mean about the high quality of our new, antique-inspired furniture in our French Country Stools Client Spotlight. Stephanie was looking for a counter-height French Country stool for her gorgeous kitchen, and she found just want she wanted in one of our French Country style stools with intricate carvings, a hand-woven rattan seat, and antiqued black washed stain. See the full story for more photos and close-up details. In other client spotlight, we delivered antique furniture to Brittany and Greg who live in this amazing castle style home in Charleston, SC. The couple wanted furniture with lions on it, so we knew that the Mechelen style of furniture would be a roaring success with them! (Flemish Mechelen furniture often boasts handsomely carved lion heads.) Sure enough, they chose an antique Mechelen stained glass buffet with lots of noble lions. They also picked a monumental 1880 antique Renaissance sideboard with massive lion’s paw feet. See the photos of the lion furniture inside the house in the Castle in Charleston Client Spotlight. I’m confident that the furniture and accessories I featured in my article Warm Up Your Decor With Copper Accents will become family heirlooms. From vintage copper plates and coal scuttle planters, to new upcycled lamps and a stunning copper backsplash, copper always creates an inviting atmosphere and a warm glow. Check out the post for some surprising ways to enjoy versatile copper in your decor, whether your taste is traditional, modern, or exotic. Finally, what about the heirloom tomato post I mentioned? I shared a little about the history of ‘love apples’ and also suggested a wonderfully refreshing and easy recipe for gazpacho. 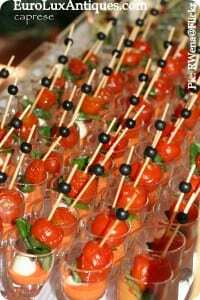 Let’s not forget my Uncle’s fantastic Bloody Mary recipe and a chic party treat of mini insalata caprese in a shot glass. 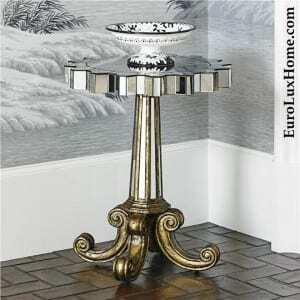 Thank you for reading our EuroLux Home blog. I’ll be back in September with lots more to say about antique decor, home furnishings, interior design inspirations and living the antiques and vintage lifestyle! If there is a topic you would like me to write about – from a particular antique furniture style to home decor tips – just email me. 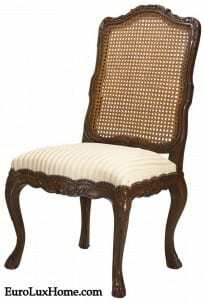 This entry was posted in Antique Furniture, News and tagged Antique Furniture, antique inspired furniture, decorating with antiques, high quality reproduction furniture, interior decor, reproduction French furniture, traditional home on August 30, 2014 by admin. We were really pleased to see how beautifully a French Country stool blended into our client’s kitchen. 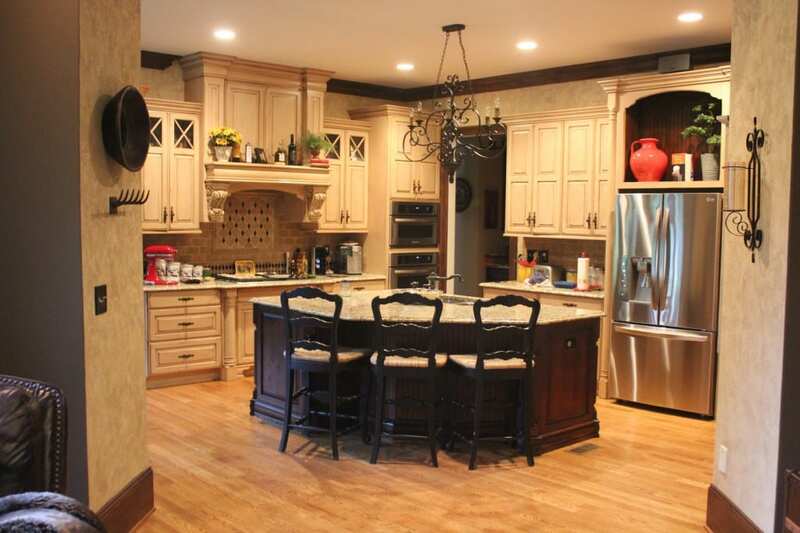 Stephanie C. already had two French Country style stools in her kitchen in Kernersville, NC. The two French Country stools featured a black wash finish and Stephanie needed a third one to match. This is the new counter-height stool that Stephanie chose from our selection of French Country stools at EuroLuxHome.com. Intricate floral and foliage wood carvings across the curvy chair rail and seat apron create a stunning decorative effect. 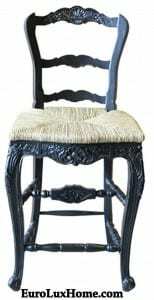 The nice cabriole legs are typical of French Country style, and this stool also boasts a hand-woven rattan or rush seat. The antiqued black washed stain adds the finishing touch! 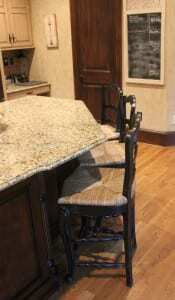 Below is the French Country stool in Stephanie’s kitchen, along with her two existing stools. Thanks Stephanie for sending the photo. I am just drooling over that kitchen – it is gorgeous! 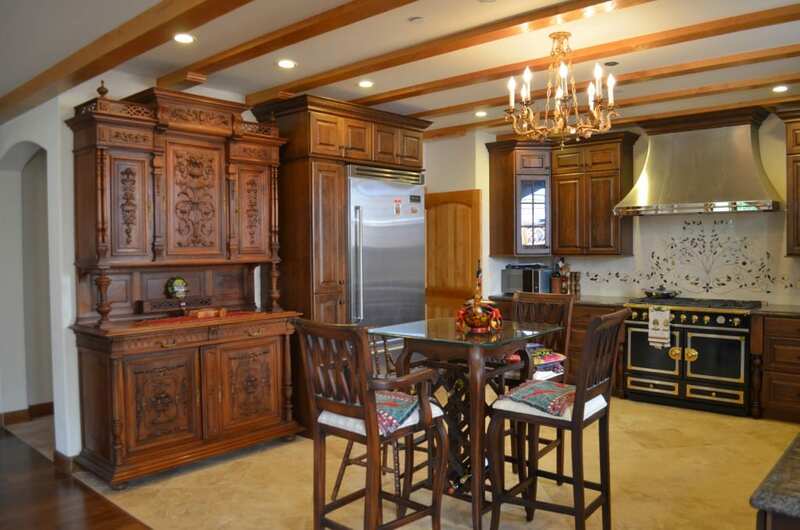 Every detail from the kitchen cabinets to the handsome chandelier is exquisitely chosen. It all adds up to a wonderful example of the traditional French Country look. I like the bright touches of sunny Mediterranean color too, in the mixer on the side counter, the yellow flowers, and the large pitcher above the fridge. The pretty carved shape of the back of the French Country stools makes a very inviting silhouette. Stephanie said “It is beautiful and a perfect match to my other two! Thanks for the great service!” You can see more detail (left) of the hand-woven rattan seats which give a nice and casual country feel. 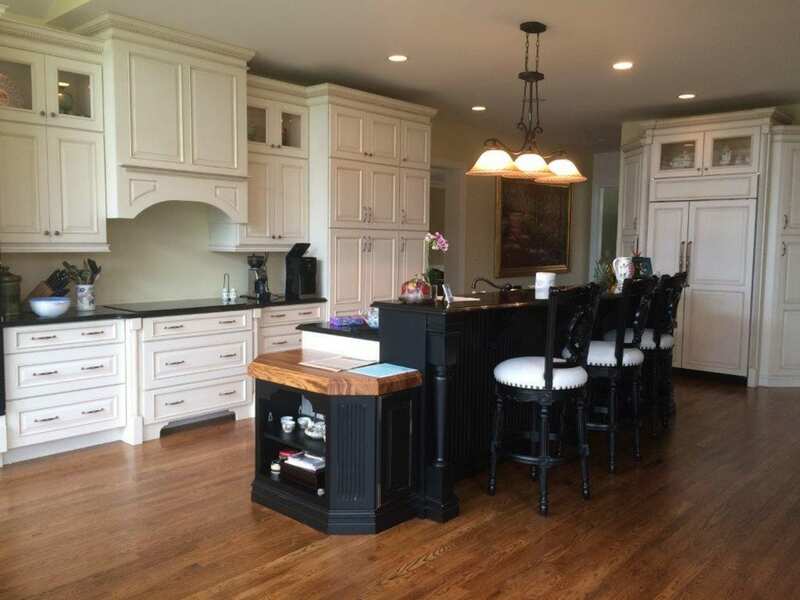 I’m guessing that Stephanie likes the black wash finish on the stools to match that elegant island counter. This close-up shows the intricate carving on the stool apron. This is actually the same French Country stool, but with a natural dark wood finish rather than the antiqued black washed stain. Still, you get some idea of the ornately decorative effect. The company that makes these stools specializes in high-quality Old World furniture designs created with traditional furniture techniques, like detailed carving, banded inlays and dovetail construction on drawers. So it’s not surprising that the French Country stool looks so lovely and authentic. Thanks Stephanie for sharing the photos of your to-die-for kitchen! 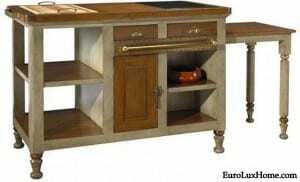 This entry was posted in Client Spotlight and tagged barstool, counter stool, French Country, French dining, heirloom quality furniture, high quality reproduction furniture, kitchen, reproduction French furniture, reproduction furniture on August 14, 2014 by admin.